Calling All Nail Polish Junkies! | velvet blvd. Calling All Nail Polish Junkies! Julep is a salon & nail polish manufacturer based out of Seattle. They create fabulous toxin-free colors that have a quick dry time & thin brushes for mess-free application. Oprah has even added their polishes to her 2012 favorite things list! The Julep Maven program is an inexpensive way to tryout new nail polish colors every month. For only $20 a month, their wonderful product team assembles & creates, fun & festive packages delivered right to your doorstep! All you have to do is take their style quiz to determine which maven you are & fill out the online application. The team at Julep wants to make sure you love your package, so every month they let you preview the colors. If you don’t love them you can skip that month. 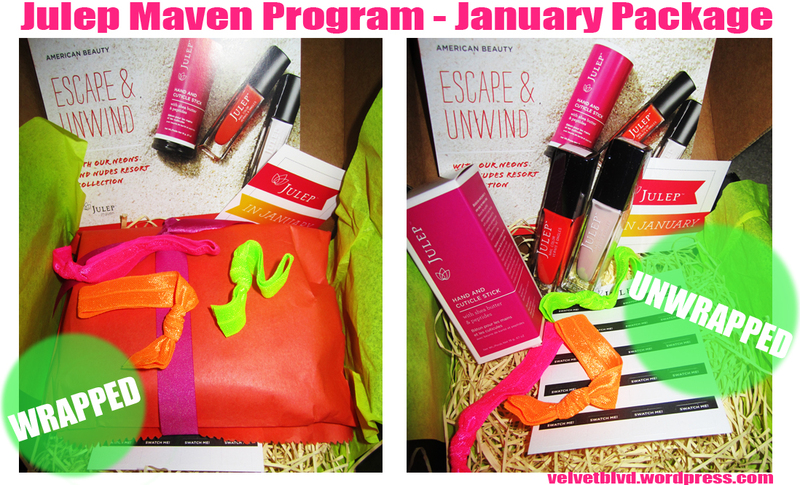 Here’s a peak at January’s package – it came with 3 neon colored hair-ties, a hand & cuticle stick & 2 trendsetting colors. P.S: I love their packaging – it comes through USPS & it’s a little black box! This entry was posted in Beauty, Favorite Things and tagged beauty, gift guide, julep, julep maven, nailpolish, neon, oprah, seattle. Bookmark the permalink. 4 Responses to Calling All Nail Polish Junkies! Thank you! Were you able to follow? Hope you’ve liked my more recent posts as well! Thank you so much for sharing this gem! I became a Maven and can’t wait to receive my first shipment! Its so fun to have a little something to get excited about every month! Thanks for the information on Julep Maven program. I signed up and LOVE all the colors I have gotten so far 🙂 Also, couldn’t agree more with the amazing packaging.